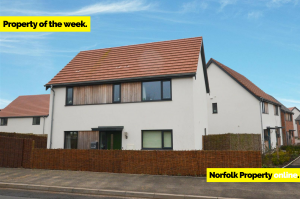 Norfolk Property Online presents a year old detached house within The Hops development in Hingham. The property features a dual aspect sitting room, modern kitchen breakfast room and downstairs w/c. On the first floor, you will find three generous bedrooms, a master en suite and family bathroom. The property is, as expected, immaculate throughout with the current vendors updating the decor beautifully and maintaining its ‘as new’ appearance. To the rear of the property, there is off road parking for three vehicles and a larger than average rear garden taking full advantage of the corner plot. This property is currently available for £325,000. Located within the thriving & historic town of Hingham, 16 miles west of Norwich City, The Hops is a new development of 88 contemporary, energy efficient and low maintenance homes, built by Abel Homes. Hingham is a pretty, small Georgian market town that has plenty of charm and history. Often called the ‘Georgian Gem’ because of the beautiful buildings that surround the old Market Place, Hingham has two greens, independent shops, cafes and takeaways, a gastro-pub, two Churches, a primary school, and village hall. There is also a sports hall and field where the town’s population can enjoy many sporting activities including football, cricket, and tennis.